The former naval aviator will be laid to rest wearing a pair of socks adorned with a picture of a squadron of planes. George H.W. Bush enjoyed wearing a colorful pair of socks for different occasions. A special pair is even picked out for his funeral. The 41st president and World War II Navy pilot will be laid to rest wearing socks adorned with an image of squadron of planes, his spokesman, Jim McGrath, said Monday. McGrath tweeted a picture of the offbeat footwear with a shoutout to the crew of the USS George H.W. Bush, an aircraft carrier: "The 41st President will be carried to his final rest wearing socks that pay tribute to his lifetime of service, starting as an 18-year-old naval aviator in war." "That legacy is now being carried, in part, by the brave, selfless men and women aboard @CVN77_GHWB," McGrath tweeted. Bush was diagnosed in 2007 with a form of Parkinson's that eventually cost him the ability to walk. He relied on wheelchairs and scooters to get around. Being so often seated, his ankles were frequently visible, and Bush wanted to make a bold fashion statement. 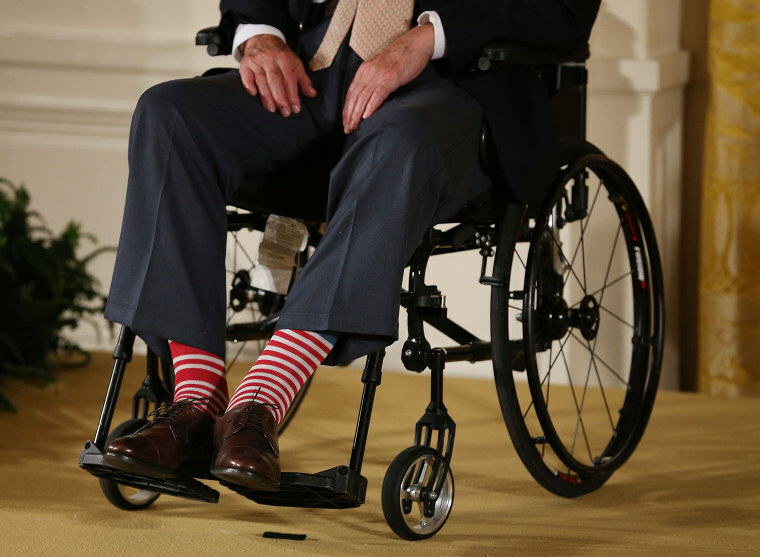 "Brandishing colorful socks is simply his way of making the best of his mobility situation and still finding the joy in life," the late president's daughter, Doro Bush Koch, wrote in her book, "My Father, The President." Bush was 94 when he died Friday night. His funeral and interment is set for Thursday at the George Bush Presidential Library and Museum at Texas A&M University in College Station. "I like a colorful sock. I'm sock man," he told granddaughter Jenna Bush Hager in a 2012 interview with the "Today" show. Bush rocked a pair of bright pink, polka-dot socks at the 2013 presidential library dedication for his son, the 43rd president George W. Bush. The former president enjoyed making a statement with his footwear, wearing stocks bearing the image of a stack of books at the funeral of his wife, Barbara Bush, a longtime literacy advocate. When he voting earlier this year, the former president donned patriotic blue socks adorned with the word "VOTE" in red and white stars. Bill Clinton, the man who beat Bush in 1992, laughed out loud when Bush met him for lunch this past summer wearing socks with the image of his former Democratic rival. "Special visit today with a great friend — and now, a best-selling author. Luckily I had a freshly laundered pair of @BillClinton socks to mark the occasion," Bush tweeted. Back in 2012 at the unveiling of portraits of George W. Bush and wife Laura Bush in the East Room of the White House, George H.W. Bush kept it relatively simple with a pair of red, white and blue socks.